Strong winds have raked the mountains, foothills and the Denver Metro area. Gusts of 80 to 90 mph have been common along and east of the Continental Divide for elevations above 9,000 feet. DENVER — Strong winds have raked the mountains, foothills and the Denver Metro area. Gusts of 80 to 90 mph have been common along and east of the Continental Divide for elevations above 9,000 feet. The strong winds are part of a powerful jet stream flow over the central Rockies. This high altitude river of air is helping to produce heavy snow in the mountains. The winds dry out and warm up as they descend into the Denver area. Temperatures reached the upper 50s to low 60s on Wednesday over most of the I-25 Corridor. The winds will relax quite a bit by midday and the snow in the mountains will let up for a few hours. Temperatures will still be quite mild on the plains, with readings in the 50s in Denver and the 60s across southeastern Colorado. A series of storm systems will begin to affect Colorado over the next several days. These storms will be racing along in the jet stream flow and will mostly impact the mountains. Snow will redevelop in the high country and will continue through early Friday with accumulations of 6 to 12 inches. Locally, heavier amounts will hit the Central and Southwest Mountains with up to 20 inches of snow around Crested Butte and Wolf Creek! There may be a little snow for Denver and the eastern plains late Thursday and early Friday, but amounts will be light and the skies will clear by mid-morning. Friday will be slightly cooler in Denver, with highs in the upper 40s to around 50 degrees. Another storm will move into Colorado this weekend. Snow will develop on Saturday for the mountains and become heavy again with another foot or more likely! 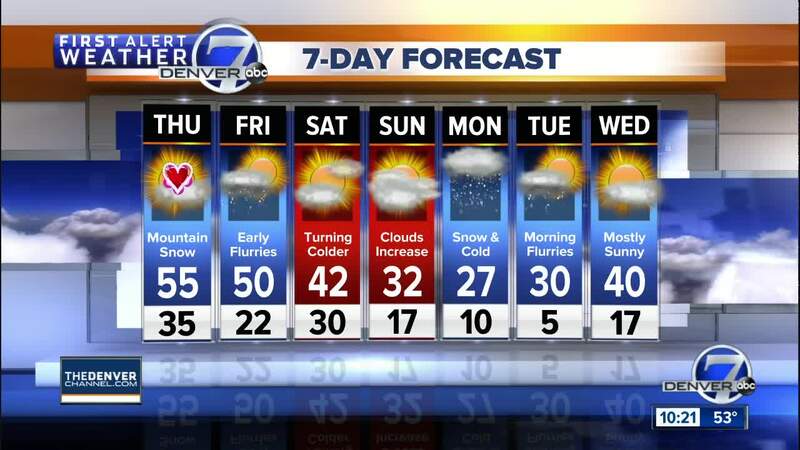 The weather will cool down in Denver on Saturday with highs in the 40s. Snow will continue in the mountains on Sunday with some light snow for Denver and the eastern plains Sunday night and Monday along with colder temperatures. Tuesday will start out cold with some flurries, followed by clearing and a gradual warming trend for much of the state.